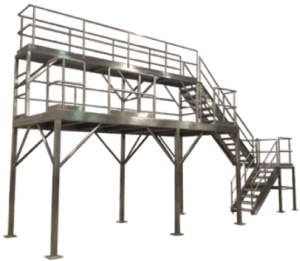 Structural platforms, walkways, and stairs provide improved accessibility to existing equipment and allow customers to maximize the use of their building space with development and installation of large-scale or vertically designed systems. Our decks, platforms, mezzanines, and ladders are available with diamond plate, slip resistant OSHA-approved FRP grating material. Platforms can be provided as stand- alone units or as part of an integrated system with features such as under-deck lighting, lifts/hoists, and stairways. Our structures are built to meet internationally recognized safety standards and can include seismic analysis and certification upon request. Materials of construction include painted or coated steel, galvanized steel, stainless steel, aluminum and fiberglass structural components. 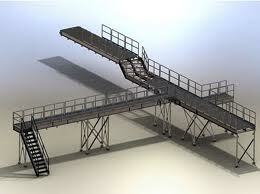 Accessories include handrails and kick-plates, signage supports, step-offs, mixer bridges, pipe supports and more.